It is the aim of Samriddhi School to provide K-12 education that sets an example for the learning community. 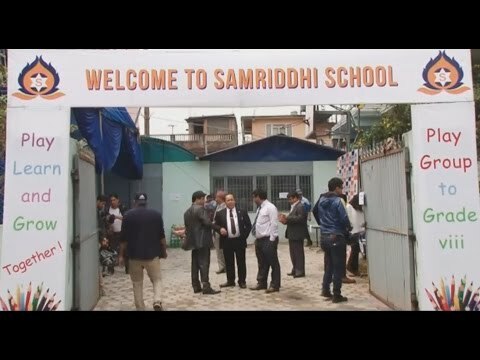 Samriddhi School appreciates diversity and realize that each young student is different and should be treated as a unique individual. The Schools puts constant endeavor to help each child realize his/her full potential and discover new horizons in learning. The School is committed to provide an outstanding learning environment for students, enabling them to thrive in a complex, constantly changing world, getting more interconnected by the day. At Samriddhi School, creativity is nurtured, with kids being treated as just kids and not rote machines, making every child feel special and cared for. There are no boundaries for learning and we always encourage trying out new ideas. It’s a school for the 21st century where learning is fun and life-long. Samriddhi School aims to introduce an extensive and balanced curriculum to enable all learners to develop the qualities and skills needed in their future lives. The medium of instruction and communication from PG to Grade 10 classes is English except for Nepali lessons. Besides English and Nepali, a third language (Chinese) is also offered from grade 5. Samriddhi School envisions itself as a dynamic and inspiring educational institution that sets an example for the learning community. The School is committed to provide an outstanding learning environment to it's students, to enable them to excel and thrive in a complex, constantly changing world, getting more interconnected by the day. For the first time in Nepal Samriddhi School is introducing the Leaders in Me program, a process based on 7 Habitat of Highly Effective People by Steven Covey which transformed the school systems around the world and benefited all. The leader in Me draws up on the talents of the whole school-all staff members and all students-and optimize the support of parents and community. The process seeks to develop the whole person-mind, body, heart and spirit. Samriddhi School is fully prepared to start The Leader in Me program and is equipped with resources brought from the USA.